To explore the full Wiki, click here or the image above. 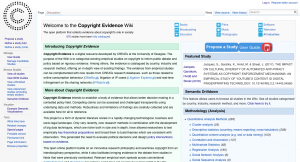 This post is part of a series of summary round-ups for new entries to the Copyright Evidence Wiki (organised thematically). As part of CREATe’s workstream for the AHRC Creative Industries Policy and Evidence Centre, the Wiki catalogues empirical studies on copyright. This month, we summarise new studies added to the database under the themes of: Piracy, Maximising Returns, Perceptions of Copyright, and Copyright and Libraries. Watson, Zizzo and Fleming’s (2016) online questionnaire reveals that the perceived benefits of unlawful file-sharing outweigh any associated legal risk for both music and eBooks. As such, they find that any drastic changes in law enforcement are only likely to have limited, and short-term benefits; instead, legal-alternatives (e.g. business models) or campaigns are more likely to be effective in reducing file-sharing behaviours. A similar solution is also proposed by Aguiar, Claussen and Peukert (2018), who studied the browsing history of 5,000 users following the shutdown of unlicensed streaming site kino.to. Whilst this shutdown resulted in an immediate decline in numbers of visits to pirate websites, within 5 weeks these figures returned to pre-intervention levels. Finally, Luo and Mortimer (2018) suggest that tackling stock-image infringement may be as easy as a 1-2-3 process. Following an email campaign to infringing firms, they find that the most effective means for encouraging the use of licensing options is: (1) clarify legal obligations, (2) raise awareness of purchasing options, and (3) mitigate search and transaction costs to users by providing pricing information and alternative image options. A study by Schuster, Mitchell and Brown (2018) finds when a new sampling work is released, sales of that original work increase. They estimate that, over a 20 week period following the release of a sampling song, that original work may benefit from an additional $1,263.60 in revenue. They encourage “forward-thinking” firms to implement a Creative Commons-style catalogue of free-to-sample works, with licensing systems that may restrict certain uses (e.g. lyrical sampling only, time limitations etc. ), and a presumption of a fair use defence (discussed in more detail by Fuller and Abdenour (2018)). Extensions to the duration of copyright apparently benefit dead authors more than the living, according to a study by Li, MacGarvie and Moser (2018). Assessing the effect of the UK Copyright Act of 1814, the study found that the price of living authors works remained relatively unchanged following an extension, whereas the price of works by dead authors increased by almost 50%. The study concludes by reminding readers of the many parallels shared by the 19th century publishing industry and today’s, and as such serves as an informative piece on modern day questions of copyright duration. Narrow exceptions may result in “imagination foregone”, according to a study by Aufderheide et al (2018) investigating perceptions of Australia’s copyright law. A survey of Australian creators revealed that 63% had changed a project due to copyright concerns, and 66% abandoned a project completely. As most uncertainty appears to arise on the question of reuse, the study suggests an open-ended fair use-style clause may result in a freer copyright regime. Understandability of publisher policies continues to be low, as confirmed by Kohn and Lange (2018) in a study of reading comprehension of copyright transfer agreements. They find that only 34% of authors understood the terms of these agreements, even if the reader has significant experience in publishing. The study recommends a parsing or translation style tool for such agreements, or to encourage publishers to use plain-speak, explicit wording in their policies. A study by Serrano et al. (2019) finds that whilst most Spanish libraries and information centres are aware of the Orphan Works Directive, most also feel that these provisions have not been implemented effectively in their line of work. A lack of detailed day-to-day guidance, combined with a lack of monetary and human resources, mean that the capacity to conduct a “diligent search” is very limited.